Early in the morning we took the ferry from pier 1 behind the Ferry Building at Fisherman’s Wharf in San Francisco across the bay to the world-renowned waterfront community of Sausalito. Half an hour after leaving foggy San Francisco we arrived in bright and sunny Sausalito. The ferry trip over was delightful offering many great photo opportunities along the way, including the Golden Gate Bridge, Alcatraz, Angel Island, which is the 2nd largest island in San Francisco bay, and the skyline of San Francisco. The ferry ride costs $22.50 round trip, with concession and children’s fares also available. You can also arrive in Sausalito from San Francisco by bus, bike, car or on the hop on hop off bus. Arriving in Sausalito was like stepping in to another world. It is absolutely gorgeous and a great escape from the madding crowds of San Francisco. Once we stepped off the ferry our first stop was to visit the small information booth which is just meters from the ferry terminal. We met a friendly, happy and helpful lady who gave us maps and suggestions for a day stay in Sausalito. From there, our next stop was for coffee and to take the time to sit and make our plan for the day. We found a little café on the waterfront, Piccolo Café that served up excellent coffee and offered magic views overlooking the bay back towards San Francisco and the bridge. Sausalito offers many attractions, unique tours, enchanting boutique shops, art studios and galleries and a wide selection of restaurants, outdoor cafés and bistros, many with stunning views back across the bay to the city. We only spent the day here however I am sure you would find endless things to do if you are staying in the area for a few days. There are many tours, cooking classes, winery tours, water sports, and the very popular bike rentals or just sit, eat and drink by the Bay. Wandering along the foreshores not far from the ferry terminal we came across the very interesting Ark Houses. An Ark House is a house built on pilings over the water. As we were standing there a gentleman with his dog came outside. We soon learned that he had been living in his Ark House for 10 years and in fact was the man who built them many years ago. He invited us to take a look inside. We were very impressed with the spaciousness and of course the location and the view looking out over the bay. After exploring the area and the shops it did not take long to realise that Sausalito certainly has a taste of Italy. There is a terrific selection of restaurants and cafés for lunch – we chose Angelino restaurant. 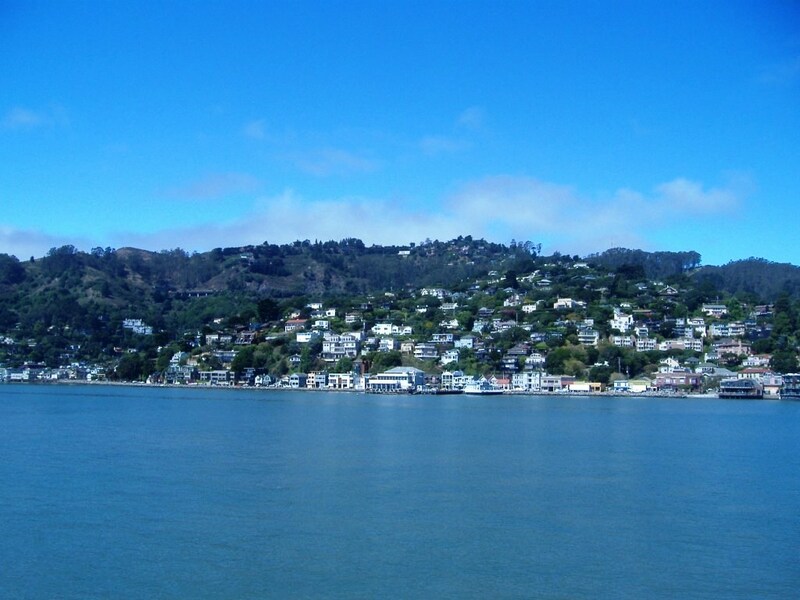 Loved Sausalito – quite upmarket – I think I went to a redwood forest near there? Such a special place Lyn. Definitely sounds like Italy. Hope you got great food to enjoy the views! :) When is your next visit to Italy? I am pining for it already! Thanks Ishita. I think we will meet. I think so too :) Have a great day! Sausalito is certainly a pleasant getaway from the hustle and bustle of San Francisco! And the ferry ride is such a bargain! Next time I visit SF, I am going to check this out. I have never been. Great post. Sausalito is gorgeous and such a lovely escape from the millions of people at Fisherman’s Wharf. It certainly has an Italian flare about it.